Today's review is for a cigar that had been hinted at for awhile, but nobody thought was going to be released anytime soon. That was until Dion Giolito, owner of Illusione Cigars, tweeted that the cigars began being shipping to retailers on July 13th. 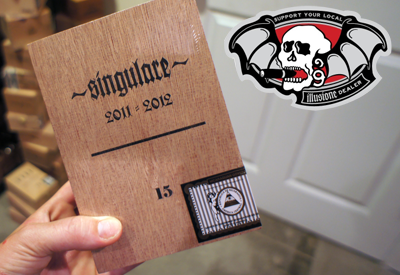 The 2012 version of the Singularé comes packed in a box containing two different cigars. 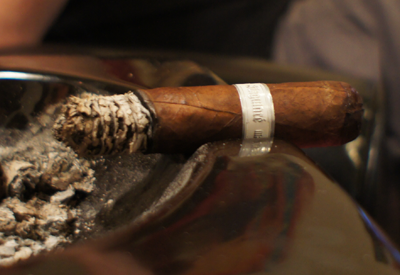 This one (the maduro) and another of the same size and shape, but with a natural wrapper. Quote from Dion about the Singularé 2012 Maduro: This was one of the blends I put together while in Miami at our “playpen.” The blend to this cigar is specific to 2 farms in Esteli, and one in Jalapa. The wrapper is maduro, San Andreas. This cigar is completely different in blend and taste profile from the Corojo 2011/2012 that sits next to it in the box. 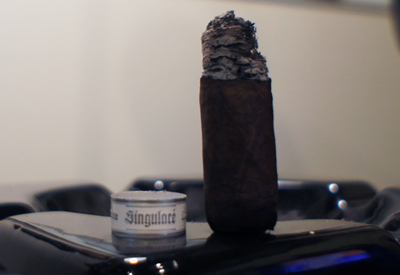 The original Singularé was a fantastic stick that I don't think received as much publicity as it deserved. Despite everyone I know who smoked enjoying it very much, it still didn't seem to gain the following other small batch releases have had in the past few years. Let's see how this release stacks up. This is the first paper-wrapped cigar I have smoked in a long time. I'm not sure what the history is behind this tradition, but it gave it a pretty cool look and made the cigar feel just a hint more special. 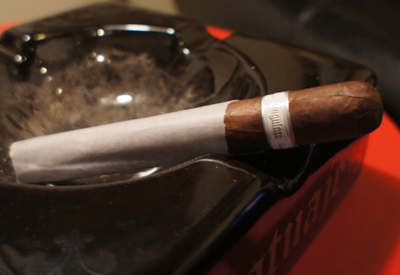 The maduro wrapper was dark brown and red color with a ton of small veins all over the leaf. The veins were so abundant that I thought it looked like a spiderweb. The aroma from the unlit cigar was full of raisin and coffee notes. The cold draw also tasted strongly of raisins. Smooth was the name of the game when it came to the first third of my Singularé 2012 Maduro. The flavor profile consisted of a slight pepper and honey combo on the front, with a coffee and cream taste on the finish. Both were refined in complexity and, again, very smooth. It almost felt like the smoke was liquid floating across my palate. Speaking of the smoke, there was a lot of it. The two of us smoking in the NHC office filled the place in no time. Make sure you have a window cracked if you plan to smoke this stick indoors. The nicotine strength was in the medium to full range. 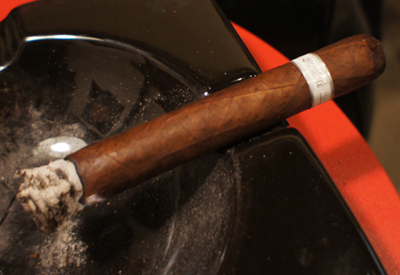 The second third of my Singularé 2012 Maduro had a flavor change up on both ends of the profile. The front end still had some mild pepper taste, but it was now mixed in nicely with some dark baking chocolate flavor. This flavor is one I find I tend to get a lot when smoking sticks with Mexican San Andres wrappers. The finish which was cream and coffee before had evolved into more of a fresh espresso flavor with a bit of a bite. I drink a lot of espresso so you can imagine enjoyed this. What this flavor did do also is ruffen up a bit of the smooth texture that I got so much of in the first third. It didn't make it harsh or unpleasant, just a different texture than before. The nicotine strength level was still medium-full. There was nothing new to report in the final third. The flavors continued to be identical to the second third with a mild pepper and baking chocolate front, espresso finish. One thing I should mention that was the consistently flaky ash from start to finish. Keep your ashtray near or you'll be burning holes in your shirt in no time. The stick maintained a medium-full in strength. 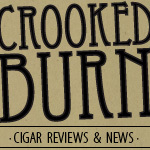 Final thoughts on the Singularé 2012 Maduro? I was worried about this cigar before I smoked it because I was not a fan of the maduro releases from Illusione in 2011. I'm happy to report that, for me, this cigar was way better than those previous releases. The flavors were strong and enjoyable from start to finish. Another release from Dion that will be added to my rotation. If you're looking for som,e you can pick them up here. Would I buy a box? Buying a box is almost like buying a sampler with the two different cigars in it. Yes, it's box-worthy.